The fourth phase of Lok Sabha elections today in seven constituencies spread across four states witnessed an impressive turnout with East Tripura registering the highest turnout of 81.8 per cent. Faced with the reality that some District Magistrates and Superintendents of Police were not initiating suo moto action on communally polarising speeches, the Election Commission of India, has issued instructions saying the area DM and SP will be responsible for taking immediate action. A tell-all book by a former aide of Prime Minister Manmohan Singh has blown the lid off the events and nature of engagement between Singh and Congress president Sonia Gandhi, suggesting the former did not always have the last word, barring the instance of the nuclear deal with the United States of America. The Congress today came down heavily on Sanjaya Baru, former media adviser to the PM, terming him an “out of job disgruntled turncoat” and rejecting his controversial book as “cheap fiction” authored for commercial gains in the election season. The BJP today tried to corner the Congress on the basis of disclosures made by Prime Minister Manmohan Singh’s former media adviser Sanjaya Baru in his book. BJP's prime ministerial candidate and star campaigner Narendra Modi is likely to visit superstar Rajnikanth at his Chennai residence tomorrow for a BJP's Prime Ministerial candidate and star campaigner Narendra Modi is likely to visit superstar Rajnikanth at his Chennai residence tomorrow for a "personal meeting." BJP’s prime ministerial candidate Narendra Modi’s name appears seven times on the cover of the Congress’ official website against just two references that party’s vice-president Rahul Gandhi manages in the same space. The Supreme Court has sentenced a cycle rickshaw wala-turned-tourist guide to 35 years in jail for murdering a 22-year-old girl from New Zealand and burying her body inside his house in an Uttar Pradesh village in August 1997. BJP leader Amit Shah and Samajwadi Party leader Azam Khan, who have been banned by the Election Commission from addressing public rallies, were today booked for violating model code of conduct while campaigning in Uttar Pradesh. Rahul Gandhi today filed his nomination papers from Amethi Lok Sabha constituency seeking a hat-trick and expressed confidence about his "good victory" dismissing the challenge from BJP's Smriti Irani and AAP's Kumar Vishwash. Hitting the campaign trail in Uttar Pradesh, Prime Minister Manmohan Singh on Saturday made a scathing attack on the BJP by describing its ideology as against the composite culture of the state and said the party had always "divided the country." "BJP leaders want to give a turn to the Lok Sabha elections on communal issues, but we all need to give more emphasis on national issues. This time, the big national issue is whether the country should have a government led by a party which has always divided the country," Singh said while addressing an election rally in favour of his party candidate here, sitting MLA Sanjay Kapoor. BJP candidate Arun Jaitley today hit back at Congress vice-president Rahul Gandhi for his remarks on Narendra Modi’s marital status in the nomination papers filed by him for the Lok Sabha poll recently. In his ‘campaign diary’ on Facebook, Jaitley said, “Why is it that Rahul Gandhi has not been able to click as a leader acceptable to this country? This is the question every Congress member must reflect upon. Congress workers allegedly attacked an Election Commission team videographing a function of their party leader Kirit Patel, who is contesting against BJP patriarch LK Advani, here today. At first glance, it is difficult to spot the difference, as "supporters" jostle to have a snap taken with the "BJP's prime ministerial candidate". The outlawed United Liberation Front of Assam (ULFA) today said Rangali Bihu, the most popular spring festival in Assam, according to local traditions. The four arrested persons, including the son-in-law of West Bengal minister Sabitri Mitra, accused of beating up Election Commission personnel, were remanded in five-day custody today. A day after a complaint was filed against BJP's PM candidate Narendra Modi over his marital status, CEC VS Sampath today said the Commission would examine it in accordance with the Supreme Court judgments. In a strong attack on Adani group perceived to be close to Narendra Modi, Rahul Gandhi said tonight that he had been given land equal to the size of Vadodara at throwaway prices and also the Gujarat coastline of the size of Mumbai coastline. Two seats of Goa, three of Assam and one each of Tripura and Sikkim today went to polls where over half-a crore voters sealed the fate of 74 candidates in voting machines. The Election Commission here said the polls were by and large peaceful. In Goa's North and South seats, the voter turnout was 75 per cent. The state went for a single-phased election. Assam's three seats - the Autonomous District, Karimganj and Silchar seats saw 75 per cent turnout. 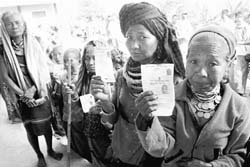 The turnout in whole of Assam was 69.6 per cent in the last Lok Sabha polls. The state has a total of 14 Lok Sabha constituencies. Tripura's Tripura (East) seat which went for polls today saw a voter turnout of 81.8 per cent. Last time, however, the turnout was much higher at 83.11 per cent. Sikkim went for simultaneous Lok Sabha and assembly elections today. The lone seat witnessed turnout of 76 per cent. The percentage in the 2009 Lok Sabha elections was way above at 83.79 per cent. "The voter turnout percentage will be higher as we are yet to get final figures. There were still long queues of voters at polling stations," said Deputy EC Alok Shukla. Prominent candidates from North Goa include Ravi Naik (Cong), BJP's sitting MP Shripad Naik and AAP's Dattaram Desai. From the South Goa seat, Congress' Aleixo Reginaldo Lourenco, BJP's Narendra Sawaikar and AAP's Swati Kerkar are among the prominent contenders. Tripura saw a multi-cornered contest. There are 12 candidates in the fray including CPI(M)'s Jitendra Chowdhury, who is the state industries minister, Congress' Sachitra Debbarma, a prominent educationist, BJP's Parkshit Debbarma, an ex-armyman, and Trinamool Congress leader Bhriguram Reang. In its instructions issued late last night, the EC said "in some cases lack of prompt intervention and close follow-up is noticed and it has taken a serious note of this". Issuing directions to DMs and SPs across the country, the EC said in case of any provocative and inflammatory speech made by any campaigner it shall be the responsibility of the District Election Officer, who is the District Magistrate, and SP of the district to initiate simultaneous measures against the offenders for the violation of the model code of conduct and for committing electoral offence under relevant sections of law. The EC has gone on to seek close monitoring and video recording of all campaigns as per existing instructions without any deviation. Daily record shall be maintained and the Centrally-appointed observers shall be fully involved in the process. Chief Electoral Officers (CEOs) in each state have been told to do a daily review and bring to the notice as and when a media report about such speeches and violations are noticed or brought to the notice. Also the CEOs have been asked to follow up on action taken by DM and SP in such case. The EC said maintenance of law and order was the most important pre-requisite of the free and fair election. The commission said it had observed that inflammatory and provocative speeches were being made by some political leaders, campaigners including star campaigners belonging to different political parties in violation of the model code of conduct. 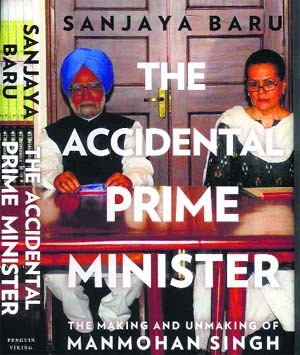 Entitled ‘The Accidental Prime Minister’, Sanjaya Baru narrates anecdotes during the time he spent in the Prime Minister’s Office as his Media Adviser between 2004 and 2008 to communicate how the authority of the office was not accorded due dignity even in the choice of his Council of Ministers. It also mentions of the difficult nature of relations with some senior leaders of the party, including Arjun Singh, AK Antony and Arjun Singh, while noting that those with Natwar Singh and Pranab Mukherjee changed over time and on issues. As for his relations with Sonia Gandhi, the author notes that while he does not claim deep knowledge of how the two dealt with each other in closed-door meetings, his account was based on what he saw and came to know reliably. A glaring example of how the Prime Minister let Rahul Gandhi take the credit for extending the MNREGA scheme across to 500 districts came when Baru sought to give credit for it to Dr Singh by sending SMS to journalists of it being a birthday gift from the Prime Minister, only to get a dressing down in due course. The incident took place in 2007 after Rahul took a delegation to Dr Singh with the request and the party spiel masters crediting then young general secretary, even though the Prime Minister had mention about it in his Independence Day speech. Towards the beginning of the second term, Baru said his re-entry into PMO was objected to by the party and later the Prime Minister told him: “I am sorry about what happened. You see, you much understand one thing. I have come to terms with this. There cannot be two centres of power. That creates confusion. I have to accept that the party president is the centre of power. The government is answerable to the party’’. Baru notes in the book that Congress leaders and Ministers did not see loyalty to the Prime Minister a political necessity and that the Prime Minister did not feel too comfortable with the National Advisory Council or even the Right to Information and its impact on decision-making process in the government. * Baru says he told the PM: “The party (Congress) wants to give the entire credit for this decision (MNREGA scheme) to Rahul. But both you and Raghuvansh Prasad (then Rural Development Minister) deserve as much credit… “No, I do not want you to project my image…Let them take all the credit, ” the PM said. Surjewala also questioned Baru’s credentials saying: “Baru’s current proximity to a strategist of Narendra Modi is well known. Timing of his allegations establish whose political agenda he is seeking to serve. Surjewala’s reference was to Baru’s recent reported closeness to BJP leader Arun Jaitley. Other Congress leaders also questioned Baru’s work with senior party leader and general secretary Shakeel Ahmed asking if it is any media adviser’s role to track the movement of files. “I am surprised to see the reports on Sanjay Baru’s work and was wondering if the role of any media adviser to the PM is to track the movement of files. It is not his job and if he has done that, he has exceeded his brief. Further, it is normal practice in political parties to recommend ministers for inclusion in the government because after all government is of the party and not vice-versa. When we supported TMC to form the government in West Bengal, I personally gave a list to CM Mamata Banerjee on the Congress representatives to be included in the state government. What is new in this? asked Shakeel. The party made a five-point poser to the PM and Congress president Sonia Gandhi, questioning them whether Cabinet files were shared with her and if Singh forfeited his prerogative to decide his Cabinet. BJP spokesperson Nirmala Sitharaman said Sonia should answer whether Cabinet files were shared with her as mentioned in the book and if the deal on Siachen was finalised by her along with Gen JJ Singh. “Did the PM forfeit his prerogative to decide on who would be in his Cabinet? Was the “2G frame” A Raja appointed at the behest of Sonia Gandhi? Did the PM knowingly overlook corruption by his colleagues as alleged in the book? 2G, CWG and Coalgate happened because of this?” were the party's other questions for the PM. Meanwhile, a day after Congress leader Kapil Sibal knocked approached the Election Commission to complaint against BJP PM candidate Narendra Modi’s marital status, the saffron party retaliated, accusing the Law Minister of “wilfully” not disclosing details of companies owned by his wife in his election affidavit. "Narendra Modi is visiting cine super star Rajinikanth at his residence in Chennai tomorrow evening," BJP's general secretary in charge of Tamil Nadu, P Muralidhar Rao, said in a post on social networking site 'Twitter'. BJP sources said the party's prime ministerial candidate would be in Chennai to address a public meeting but before that he would go to super star's residence around 5 pm for a "personal meeting". Asked whether the meeting could have any implication for Lok Sabha elections, the source said "it is a personal meeting" but hastened to add that "Narendra Modi and elections cannot be separated." The overpowering presence of Modi in Congress’ campaign strategy is evident not just in the political speeches of its leaders but also in the party’s communication platforms that are more about “why people should not vote for Modi” than anything else. The latest addition to the list of Congress’ anti-Modi justifications is the BJP leader’s ambiguity on marital status that he concealed in the election affidavits since 2001, only to disclose this year to run as a candidate from Vadodra. By raising the issue concerning Modi’s marriage, the Congress may have departed from its oft-stated stand of abstaining from making personal remarks on rivals, something party chief Sonia Gandhi and Rahul have espoused for long. Though the Congress today defended its stand on Modi saying it was a matter of credibility of a person aiming for top post, the question is why the Congress is repeatedly departing from its own position in its bid to stop Modi. The second article invokes Vajpayee and says: “Nobody to remind BJP of its Rajdharma”. The third reads: “When we were busy paving the way for progress of India's women, BJP was busy snooping on innocent women in Gujarat” in a clear reference to Modi’s involvement in a snooping scandal. And lastly, the website talks of how Modi’s men fudged Gujarat’s economic data to spin them in his favour. The murder had come to light a year later when her skeleton was dug out from his house on August 19, 1998 following a complaint from her father. The trial court and the Allahabad High Court had given him death penalty. The SC commuted it, holding that no evidence was available to prove that the young tourist had been murdered in a gruesome manner to make it a “rarest of rare cases” warranting capital punishment. “We are inclined to commute the death sentence to life and award 20 years of rigorous imprisonment, over and above the period already undergone by the accused, without any remission, which in our view would meet the ends of justice,” a Bench comprising Justices KS Radhakrishnan and AK Sikri ruled in a verdict yesterday. The convict, Dharam Deo Yadav, has been in jail for more than 15 years, since his arrest in 1998. Yadav, who was running a cycle rickshaw from 1993 to 1996 before becoming a tourist guide, was working at the Old Vishnu Guest House in Varanasi where the victim had stayed for four days from August 7-10, 1997. Yadav had confessed that he took the victim, Diana Clare Routley, to his village (Brindaban in Ghazipur district) as she wanted to go there. Once inside his house, he killed her by strangulating her to take the cash and other valuables. He was convicted and sentenced on the basis of having been seen last with the victim and other circumstantial evidence, including the DNA test conducted on her remains and her father which confirmed that she was the daughter of the complainant. “Since the dead body was found in the house of the accused, it is for him to explain as to how the same was found concealed in his house,” the SC ruled, upholding the conviction. * The trial court and the Allahabad High Court had given him death penalty. The SC commuted it, holding that no evidence was available to prove that the young tourist had been murdered in a gruesome manner to make it a "rarest of rare cases" warranting capital punishment. The UP police registered two cases against Narendra Modi's close aide Shah in Muzaffarnagar. While one case has been registered in the Kakroli police station, another has been registered in the Newmandi police station, Additional District Magistrate Indermani Tripathi said. Shah has been accused of making objectionable speeches in Badwar village in Muzaffarnagar on April 4, where he reportedly said: “If Modi wins, Mullah Mulayam’s government will fall.” Shah has been booked under section 188 (Disobedience to order duly promulgated by public servant) of the IPC and 123(3) of the Representation of the People Act (relating to appeal by a candidate to vote on the ground of his religion, race, caste, community or language), Tripathi said, adding that Shah’s speeches were found objectionable. Shah today said he would urge the EC to review its decision after considering his response, in which he would explain the context of his remarks. "I respect the EC and have not addressed a single meeting since its order,” said Shah, who has also been booked in Shamli, Bijnore, for his "revenge" remarks. Rahul was accompanied by mother Sonia Gandhi, sister Priyanka, brother-in-law Robert Vadra, niece Maira, family friend and former MP Satish Sharma and Rajya Sabha MP Sanjay Singh and his wife and Sultanpur Congress candidate Amita Singh. 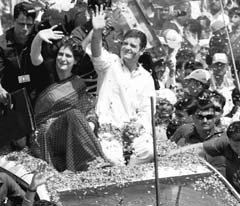 Rahul along with other family members were showered with 500 kg of rose petals on their way to file the nominations. According to the affidavit filed by Rahul, his total assets are to the tune of Rs 9.4 crore, a four-time increase from the 2009 declared asset of Rs 2.32 crore. In 2004, his assets were mere Rs 55,38,123. Interestingly, while the 2014 immovable assets do not show two properties in Saket, the value of his existing assets has increased due to the increase in the value of his assets. He has a 50 per cent share in a joint inherited property of grandmother Indira Gandhi in Mehrauli worth Rs 1.32 crores. The remaining 50 per cent is sister Priyanka's. Speaking to the media, Rahul was confident of a victory by good margin. Rahul denied anything personal about his comments regarding BJP prime ministerial candidate Narendra Modi marital status in Doda. Referring to the controversial statement by BJP leader Amit Shah asking voters to avenge Muzaffarnagar riots, the Prime Minister said, "You have heard the speech of one of the BJP leaders. The question before you today is whether you will tolerate it and till when. UP is known for its mixed culture and there is a tradition of respecting each others religion, and I want to tell you that BJP's ideology and works are against this 'ganga-jamuni tehzib' (composite culture)". "Uttar Pradesh has always been politically important, and this time also the Lok Sabha results in the state would decide who would form the government at the Centre," Singh said. BJP candidate Arun Jaitley today hit back at Congress vice-president Rahul Gandhi for his remarks on Narendra Modi’s marital status in the nomination papers filed by him for the Lok Sabha poll recently. In his ‘campaign diary’ on Facebook, Jaitley said, “Why is it that Rahul Gandhi has not been able to click as a leader acceptable to this country? This is the question every Congress member must reflect upon. Jaitley said that Indian politics has an unstated code of conduct in which ordinarily “we don’t drag families and ladies into controversy”. However, he alleged that Rahul Gandhi was guilty of breaching that code saying “he must remember that the disturbed matrimonial relationship of a former Indian Prime Minister was never a political issue”. “How many current senior Congressmen are in illicit relationships and yet have paraded their wives only for photo opportunities during nominations. Surely if the people have a right to know about the legal relationship of Modi, they also have a right to know about the illicit relationships of Congressmen. “The latter is more relevant for the people’s right to know about the ethics of their candidates,” he said. However, devoid of serious political issues and understanding of those issues, Rahul Gandhi has reflected his immaturity and desperation by making the ‘Modi marriage’ a political issue, he added. Meanwhile, talking to mediapersons here this morning, Jaitley said the revelations made by former media adviser to PM, Sanjay Baru, in his book has vindicated the BJP’s stand that Manmohan Singh is the weakest Prime Minister of the country. However, a closer look reveals it is not Narendra Modi but his lookalike Vikas Mahante, who is having a hectic schedule during the ongoing poll campaign, with increasing demand from saffron alliance candidates to participate in their events. The 52-year-old businessman from suburban Malad, who is otherwise apolitical, cannot help predict the outcome of the Lok Sabha elections. "I see a Modi wave. And in a big way," Mahante told PTI as he readied to set off for another road show, this one to campaign for Shiv Sena candidate from Mumbai North West constituency Gajanan Kirtikar. Asked how it feels to be mobbed as a Modi lookalike, Mahante recalls the incident in December, when the real Modi visited Mumbai and he went at the rally venue to catch a glimpse of him. The crowd, mistaking Mahante for Modi, surrounded him and it was after much difficulty that security personnel were able to separate him from the "fans" who thought he was the real Modi. Asked what other "similarities" he shares with the Gujarat Chief Minister, besides his looks, mannerisms and attire, Mahante says that like Modi he also loves poetry. Kirtikar said Mahante's resemblance to Modi has made him a crowd-puller. For the "Modi from Malad", being mobbed on road by people wanting to click photos with him is a daily routine. Mahante recalls the "tremendous response" he got while participating in a road show for BJP candidate Gopal Shetty, who is contesting from Mumbai North Lok Sabha constituency. He came into spotlight a month ago after some photographers spotted him at an event here and noticed his uncanny resemblance to the BJP leader. A month later, Mahante is now used to people approaching him, asking for photos. "I oblige. They want to tell others they met Narendra Modi," he says and recalls meeting the real Modi during a visit to Gujarat last year." In a statement e-mailed to the media here, the ULFA called upon organisations celebrating Rangali Bihu in Assam to refrain from facilitating showcasing of outside culture, including singing of Hindi movie songs, as part of celebrations. "The complaint has come before the Commission just as we were leaving yesterday to come on this tour. There are some very clear judgments of the Supreme Court on the matter. The complaint will be examined in the light of relevant provisions of law and the Supreme Court judgment," he said. Senior Congress leader Kapil Sibal had moved the EC yesterday over the issue of the marital status of Modi and sought action against the BJP leader for "hiding" facts in election affidavits filed by him in the past. He said between 2002 and 2012, Modi had filed election affidavits while contesting the Gujarat Assembly elections, where he had not mentioned his marital status. To another query on recent speeches of SP leader Azam Khan, the CEC said, "It is a matter of great concern and the Commission is seized of the matter ... We have sent a letter to the government of Uttar Pradesh about the need for filing an FIR in every case of such hate speech." Without explicitly mentioning the group by name, the Congress vice-president alluded to it when he said, "land equal to Vadodara was given to him. Do you know for how much? For Rs 300 crore. Coastline equal to Mumbai was also given to him." He was asked specifically during the interview to a news channel whether he was referring to the Adani group to which he said he would not like to name anybody. Vadodara has an area of 149 sq km and the Mumbai coastline is 167-km-long. "When Gujarat grew, it was because of the small industries, because of movements like Amul and that is its strength. Now you see the Gujarat model, the turnover of one industrialist has grown from Rs 3,000 crore to Rs 40,000 crore," Rahul said. He went on to add that Modi's economic model is that the "entire money of the state should be given to two-three persons. This mindset is also dangerous for the country. I keep fighting against such mindset." Though he did not name the Adani group, Rahul has in the recent days been attacking it. Slamming Modi's development model, he said "the reality of Gujarat is that two-three industrialists are prospering" while people are dying in the state. "Their (Modi's) focus is on benefitting three-four industrialists so that there is trickle-down effect. Trickle-down effect happened in the US also and it has gone bust," the Congress leader said. He insisted that UPA government headed by Manmohan Singh had performed better than NDA even though there was slowdown in growth briefly because of global recession. While listing a number of programmes and achievements of the UPA government, he said, "The reality is that we have been in power for 10 years... There will be little bit of anti-incumbency." When pointed out that the election campaign had become personal, Rahul said he has "no interest in personal attacks and I don't indulge in that." He added, "Narendra Modiji is a person. He has his issues. I have nothing to do with that. But he represents an ideology. This ideology pits one Indian against another Indian. That is dangerous for the country. My fight is against this ideology."